I used an app called Daily budget up until I began using Monzo. The idea is you input all your regular spending, tell it what you get paid, and tell it how much you want to save at the end of the month. It then tells you how much you can spend per day, and any over or under rolls over to the next day. I’ve just started using Squirrel. Similar idea. It takes off bills, then savings and then pays you weekly. I think being able to budget daily or weekly is a game changer. Gets you out of the mentality of thinking you have loads to spend when your salary comes in. I’d really like to be able to implement this with Monzo. Perhaps some of those features could be included when the targets are reworked, after the current accounts launch. I used YNAB until I got out of debt (then I moved to the UK from Australia and the travel blew it out of the water). Their approach of assigning dollars to your various life categories at the start of your pay period works really well. ‘give every dollar a job’ as soon as you receive them. the difficulty with YNAB is it only works on a month-to-month interval. Monzo could jump in by offering a service based on users’ pay-to-pay interval. If we could assign all our money to our budget categories up front (bills, rent, etc) then monzo could calculate what we could spend daily with what we have left. I used to use YNAB too. I eventually got put off by having to do lots of manual entries for all my transactions. I think those kind of budgeting programs are great if you can set aside some time each week. I’m more excited with Monzo as I’m hoping it’ll be like an automated version of YNAB. YNAB means “You Need A Budget”. YNAB is a multi-platform personal budgeting program based on the envelope method. It was noted by Lifehacker in 2013 as the most popular personal finance software amongst its readers. You Need a Budget (YNAB) (pronounced Y-nab) is a multi-platform personal budgeting program based on the envelope method. In 2013 it was the most popular personal finance software among Lifehacker readers. The latest version, dubbed "The New YNAB," was launched December 30, 2015 as a web-based application, with companion apps for iPhone, iPad, and Android devices. I use “Pariti” to see when my bills are coming out… to be honest I still use it alongside monzo, just to keep on top of what will be coming out of my account! I find both really useful! Yeah there’s definitely a lot of work involved with YNAB. You have to be motivated to get out of debt of save for something specific - it’s very much about being intentional with how you set aside your money. If Monzo could automate most of the easy bits (for example - pre-filling regular expenses), but still keep some kind of intentional ‘setting aside’ mechanism every pay it’d be the perfect product. Or if YNAB could develop a plug-in for Monzo that’d be perfect. Yeah I think bank integration goes a long way to making YNAB less work intensive. I’m kind of hoping that monzo and other such banks will make the need for YNAB irrelevant. 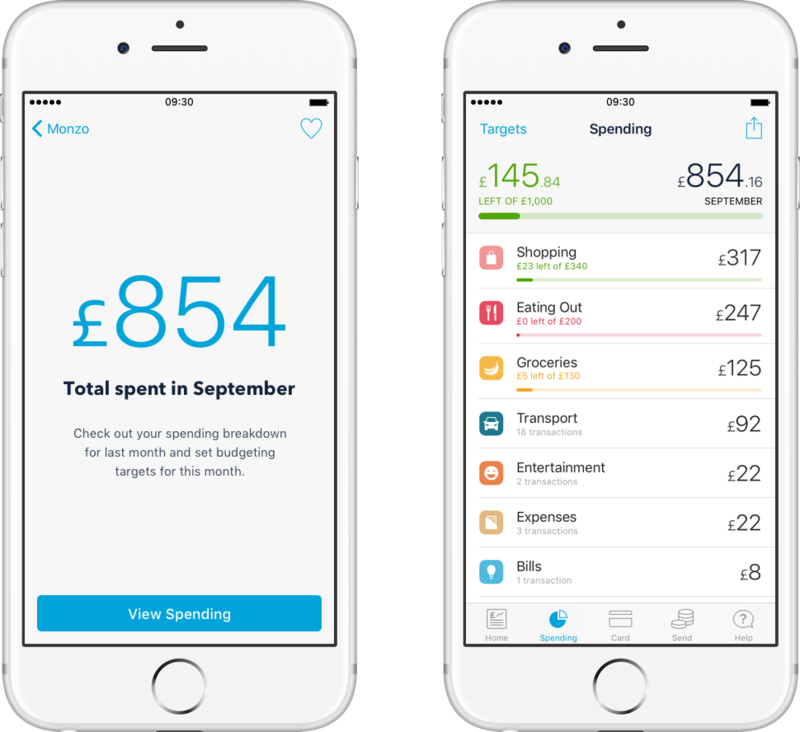 I use two apps in conjunction with my highstreet bank - one called ‘Pennies’ (for the pro-active budgeting aspect) and one called ‘Spending’ (for the retrospective tracking & reports). The pennies app lets you switch between a ‘daily’ view and whatever term defines your budget i.e. a ‘Fun’ budget, set to expire/renew after a month shows you e.g. £540 left for the month and £19 left for today. Or a weekly food budget shows you e.g. £80 left for the week and £11 left for today. I see that the ‘targets’ feature of Monzo keeps you updated month to month but it would be great to set weekly/custom/one-off budgets as well because you might want to be a bit more eagle-eyed with tracking expenses. I’ve developed a spreadsheet that I use in the iOS Numbers app that I think could be used as a model for an in app feature similar to all these apps. I can email it to you if you like? fancy sharing it on here? One of the things I miss from the prepaid card is the reminder notification of how much you spent today. @acp Sounds great! Feel free to share on here! Correction - general notifications will be back today but unfortunately spending reminders like this are something separate so we will have to wait a little longer for them to arrive on the CA. @Naji @leonardh I can’t as it’s an Apple .numbers file. But here are the screenshots with notes. many tweaks and changes. (Obviously I’ve used example figures for this demo). This is the main budgeting section. The outgoings in this section are mandatory/recurring monthly costs. This is the day to day management section, the bit I use most. At the moment I manually type in every spend as I spend it. Doing this means delayed charges (TFL, Online, etc) are accounted for immediately to avoid nasty “oh yeh I forgot I spent that” moments. I would be interested to hear what you all think. Obviously, if Monzo integrated this model into the app it would save me having to do it manually. But I’d still want to have a ‘daily notes’ or ‘upcoming charge alert’ for those delayed spends. I.E. Put a spend into a day manually, as a note…? I use Bluecoins on Android - it’s pretty detailed so there is a bit of a learning curve but well worth it once you’ve got it up and running. It does require you to manually input all transactions, transfers and income (recurring transactions can be automated) but I actually find this useful. It makes me more aware of what I am spending / have left to spend. @acp that looks very cool (nothing like some good spreadsheet geekery ). Would be great if you could work out how to export & share as an excel readable file.